Most traditional potluck salads are loaded with refined grains, starchy vegetables, and/or contain heavy dressings full of dairy or mayo. Not this Summer Squash Potluck Salad! This version is a wonderful and simple way to enjoy the seasonal produce of summer; and since it is vegan, paleo friendly and gluten-free, it’s perfect for everyone to enjoy! Spiralize the zucchini/squash using a spiralizer, or peel the zucchini/squash into long ribbons (like fettuccine) using a vegetable peeler. Toss the zucchini/squash with the salt. Add the coconut oil to a saucepan over medium heat. Add the zucchini/squash noodles and sauté for 4–5 minutes, until the noodles are al dente and just tender. Remove from heat and let the zucchini/squash noodles sit in a colander for several minutes to drain. 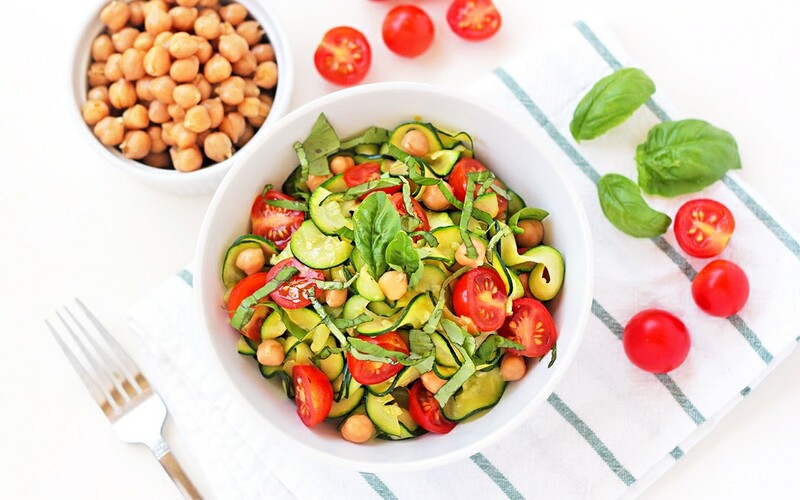 Once all excess water has been removed, toss in the chickpeas, tomatoes and basil, and drizzle with the olive oil. Add additional salt and pepper to taste (if desired). Store in the refrigerator until serving. Serve cold.